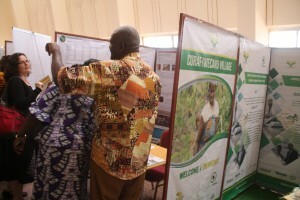 To this end, an extensive and varied documentation was made available to a hundred visitors who get the knowledge on adaptation to climate change through the results of AfricaInteract project. Let us remind that the objective of AfricaInteract Project coordinated by CORAF WECARD is to establish an effective and efficient dialogue between researchers and policy makers to help vulnerable populations in sub-Saharan Africa to adapt on the vagaries of climate change. It operates in three business areas such as agriculture, health and urban areas.